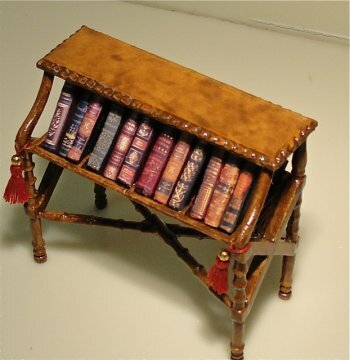 This bookrack has been burled, tasseled and filled with twelve of my handmade books. The pages are hand cut, glued together, then "gold" leaf is applied to the edges. They are wrapped with genuine leather. It is one of my personal favorites! No two will be exactly alike, as I make the books from many different color leathers.